We encourage you to print this information guide and bring it with you for the weekend. Don't forget to also print the detailed schedule for the weekend and the directions to camp. If you have any questions, please do not hesitate to contact Scot Nicoll at 614.488.0681 ext. 122. We’re looking forward to a terrific weekend! Our weekend begins with check-in from 6:00 to 7:00 pm in the Lodge. Please arrive to camp having already eaten dinner. Report to the Lodge for check-in before unloading any of your personal items. We will give you your room assignment and our staff will help you unload your belongings. It is our desire that all participants be in camp for the entire weekend. Late arrivals and early departures disrupt our sense of community and should be brought to the attention of the Camp Director in advance. Families may take their vehicles to the main entrance of the Lodge to unload their personal belongings. Once unloading is completed, we invite you to park your cars on the perimeter of the gravel circle in front of the Lodge or along the roadway approaching the gravel circle. For the safety of all campers, we ask your help in keeping traffic in camp to a minimum. Please do not park directly in front of the Lodge or Dining Hall at any time. This space is reserved for emergency and staff vehicles only. Each family will be housed in one of our sections of the Lodge or in our hillside cabins. These spaces will be assigned for each family based on when they registered and what was requested. Thank you for understanding that our growing Family Camp enrollment has not allowed for everyone to stay in one space. All areas will be more than adequate for a fun weekend at camp as a family! Each hillside cabin has two box fans and a water cooler to help keep you cool and hydrated. Our summer staff and high school volunteers will be staying in hillside cabins as well as some of the rental cabins. We ask that you respect the privacy of all rooms and cabins occupied by others. All restrooms and shower facilities in camp are designated male or female. There is one of each on the hillside to serve the hillside cabins, as well as one of each on each side of the Lodge. Please do your part in keeping our restrooms clean and functioning. Each participant must bring all necessary bedding and linens for the weekend. All beds are twin size bunk beds. We suggest bringing either sheets (single fitted sheets and blankets) or sleeping bags. The hillside cabin beds are also bunked, twin size, and built-in (immovable). Camp does not own any cribs or infant beds, so please bring your own if needed. You will need to bring your own bath and beach towels. Laundry machines are available. They are located in the lower level of the Dining Hall just beyond the Craft Cabin. A staff member can help you locate them and provide detergent. We will share family-style meals three times each day at tables in the Dining Hall. You will have assigned seating for our first meal together to encourage efficient use of our limited space. A snack will be provided each evening between program events. A reminder bell is rung 10 minutes before each meal; please wait outside the Dining Hall until staff members invite you in. If you have special dietary needs or food allergies that you have not entered into your registration, please email Registration@CampAkita.org at least one week prior to Family Camp. If your small children have food likes or dislikes, feel free to bring snacks and food items with you and we will do our best to accommodate any preparation needs. Please note! Camp Akita is a nut-free environment. Do not bring any food items with peanuts or tree nuts. Camp does not own high chairs or booster seats, so please bring your own if needed. Some refrigerator space will be available in the Lodge for small items. Babysitters are available during the evening activities each day. Sign up sheets will be posted in the Lodge at check-in, and just inside the front doors of the Dining Hall for the remainder of the weekend. The babysitters are primarily volunteer high school students participating in our L.I.F.E. Guard service program. They are scheduled on a first-come, first-served basis, and there is no charge for this service. Families are encouraged to coordinate babysitters that might be shared among families housed together. Each morning at 9:00 am, a meditation will be given at Vesper Hill, located just past the Lodge beyond the gravel circle. All ages are welcome and encouraged to attend. We invite you and your family to "Enter in Silence, Leave in Peace." On Saturday and Sunday mornings we will provide supervised activities for all children in camp. Campers will be broken into groups based on age. During this time, from around 9:30 to 11:30 am, parents are encouraged to explore Akita on their own, sign up for activities, or just relax. Additional details of the morning program will be covered during the parent meeting on Friday night. Craft Cabin: Located in the lower level of the Dining Hall. Lake: There is a designated area for swimming and a separate area for rafting and canoeing. Children under age 12 are not allowed in or near the lake without an adult chaperone. A Waterfront Director will be on hand to make your lakefront experience enjoyable. Please respect all guidelines set forth by the Waterfront Director. Alpine Tower & Giant Swing: Sign-ups will be posted at check-in and then available in the Dining Hall. Options: Extra activities will be offered such as sports, hikes, friendly competitions, goofy games, kids art show, prayer beading, and so on. Akita Café: If an afternoon snack is what you desire, the café will be open during afternoon free time. The café is located in the Lodge on the lower level. Maps are available for adults who may want to hike the Akita trails. There are some beautiful places to visit such as Rock Stalls and Bald Eagle. If you are planning a remote hike, please inform a member of our staff so that we can keep an account of all campers. New this year: From 3:30 to 4:30 pm on Saturday and Sunday, our summer staff will be offering optional family activities. These activities are designed for all ages and for groups of families to enjoy together. Saturday’s activities will focus on exploring our natural world and Sunday’s activities will be centered around the lake. This year, we will have scheduled family time each evening starting at 7:30 pm. Our staff will have organized activities for older children so parents can focus on their little ones. 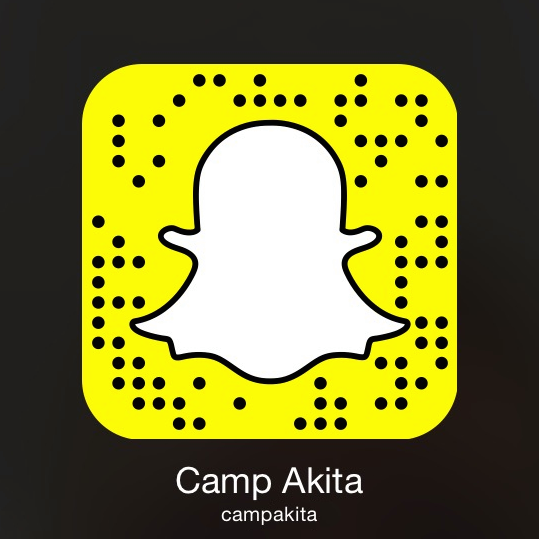 This is a great time to wind down with your family and talk about the amazing day you had at Camp Akita. There will also be a snack available to you at this time. Board games and cards are available upon request in the Akita Café. Athletic equipment (basketballs, Frisbees, soccer balls, etc.) is available as well and can be requested through any staff member. Families are responsible for storing and administering their own medications. In case of an injury or emergency, find a staff member carrying a two-way radio and ask them to call for Tim Carlson, or go to the summer staff office in the lower level of the Dining Hall and ask for help. A reminder bell is rung 10 minutes before each meal; please wait outside the Dining Hall until staff members invite you in. In case of a severe weather emergency, we will ring the bell repeatedly in a pattern of three quick rings followed by a pause, which will alert you to come to the lower level of the Lodge or Dining Hall. Please remind your children not to ring the bell, as it may cause an unintentional alert in camp. Campers are asked to observe quiet hours in camp from 11:00 pm to 7:00 am. Please do not play basketball, listen to loud music, or have loud conversations during these hours. As a courtesy, we ask you to sweep your cabin and empty your trash can in the dumpsters near the Dining Hall. We encourage you to help keep Akita beautiful! Do not leave any trash at the lakefront, on the decks, or anywhere around camp. If you find an area that needs special attention, please tell a staff member. Our L.I.F.E. Guard participants are here to help and happy to clean up an area for you if it needs attention. Open fires are restricted to the campfire areas only. Cigarette and cigar smoking is not permitted in any of the buildings in camp. If you are a smoker, check with the Camp Director for the location of designated smoking areas. In order to stay consistent with our summer camp policy, alcohol is prohibited during the Family Camp weekend. For any questions, please call 614.488.0681 ext. 122. Camp Akita is not responsible for any lost or stolen items. Please lock your valuables in your car or secure them in your cabin or Lodge room. Tim Carlson, the Camp Director, will be on site throughout the weekend. In addition, we will have our world-famous college-age summer staff on hand to guide us through the Akita-style fun and games. Finally, a work crew of high school volunteers called "L.I.F.E. Guards" will see to your needs at our family-style meals and attend to general camp clean up throughout the weekend. The phone number for the summer staff office is 740.385.3827 ext. 228. During Family Camp, the voicemail on this phone will be checked several times each day. Camp Akita is a nut-free environment. Please do not bring any food items to camp containing peanuts or tree nuts. In consideration of other campers, we ask that you not bring any pets with you.